91 Places To List Your Tours www.tourismtiger.com /blog/86-places-to-list-your-tours/ As a tour operator, it’s vital that you leverage the internet as much as possible to increase your tour sales. We’ve spoken a lot about the Octopus Method to improve your internet presence, but we wanted to up the ante: so much so that we spent months scouring the internet finding places to list your tours. The result? list of epic proportions. The best news? Most of the sites are free to list on. Some allow you to advertise your brand — directing travelers to your site to make bookings, while others sell your tours for you. Some are niche and target specific audiences, while others are all-encompassing OTAs that reach millions of people across the globe. Due to the sheer size of this list, you might be wondering which you should list your tours on. Our advice? List them on as many platforms as possible — as long as they are somewhat relevant to your tours. Enjoy! These guys are massive OTAs that have been around for awhile. They reach millions of unique global visitors a month. They usually top the rankings when it comes to booking anything travel related. As such, they are the go-to for a lot of travellers when making bookings as they are known to be super reliable and have excellent customer service. You definitely want to list your tour with these guys. 1. 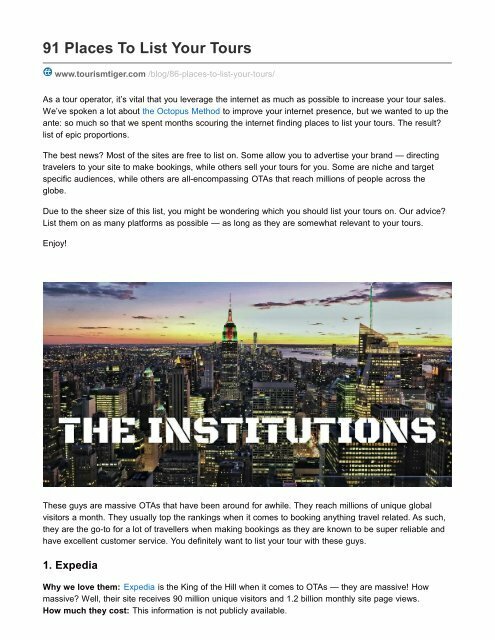 Expedia Why we love them: Expedia is the King of the Hill when it comes to OTAs — they are massive! How massive? Well, their site receives 90 million unique visitors and 1.2 billion monthly site page views. How much they cost: This information is not publicly available.